The United States spends twice per person on health care what most other advanced nations spend without better outcomes to show for it....Rightly understood, health-care entitlement reform is not, as conservatives suggest, a matter of lessening the dependency of big chunks of the population on government largesse. It’s about weaning the members of our medical-industrial complex from their entitlement to far higher payments, despite shabby results, than their counterparts abroad get. This license for inefficiency, issued by both parties to doctors, hospitals, health plans, drugmakers and device firms, is diverting precious resources in an aging America from urgent non-health care, non-elderly needs. We pay our doctors about 50% more than most comparable countries. We pay more than twice as much for pharmaceuticals, despite the fact that we use less of them than most other countries. Administration costs are about 7x what most countries pay. We perform about 50% more diagnostic procedures than other countries and we pay as much as 5x more per procedure. The chart on the right, from a McKinsey study, is based on "Expected Spending According to Wealth." That is, richer countries tend to spend a higher percentage of their income on healthcare, and since the United States is one of the richest countries on earth you'd expect us to spend a lot. That's ESAW. But even if you take that into account, we still spend about $2,000 more per person than we should. The McKinsey chart breaks that down into totals. 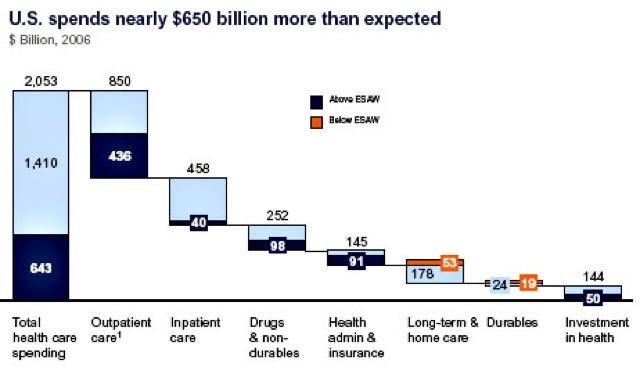 About a third of our total spending (the dark blue bars) is above ESAW, and that's divided among outpatient care, inpatient care, drugs, adminstration, and investment. Needless to say, although this may be excess spending to you and me, it's excess income to doctors, nurses, hospitals, and the pharmaceutical industry. And you can hardly expect them to accept cuts to their income without a fight. Nonetheless, that's where a big chunk of our problem lies. Either we start paying all these people less, or else our healthcare costs are always going to be sky-high. Paul Ryan, despite his reputation for courage and wonkiness, doesn't have the guts to say this. But the truth is that there's really no way around it.